New work from an international team of astronomers including Carnegie's Jaehan Bae used archival radio telescope data to develop a new method for finding very young extrasolar planets. Their technique successfully confirmed the existence of two previously predicted Jupiter-mass planets around the star HD 163296. Their work is published by the Astrophysical Journal Letters. Of the thousands of exoplanets discovered by astronomers, only a handful are in their formative years. Finding more baby planets will help astronomers answer the many outstanding questions about planet formation, including the process by which our own Solar System came into existence. Young stars are surrounded by rotating disks of gas and dust from which planets are formed. The 60 radio telescope antennae of the Atacama Large Millimeter/submillimeter Array, ALMA, have been able to image these disks with never-before-seen clarity. The research team—including lead author Richard Teague and co-author Edwin Bergin of the University of Michigan, Tilman Birnstiel of the Ludwig Maximilian University of Munich, and Daniel Foreman-Mackey of the Flatiron Institute—used archival ALMA data to demonstrate that anomalies in the velocity of the gas in these rotating protoplanetary disks can be used to indicate the presence of giant planets. Other techniques for finding baby planets in the disks surrounding young stars are based on observations of the emission coming from a disk's dust particles. But dust only accounts for one percent of a disk's mass, so the team decided to focus instead on the gas that comprises 99 percent of a young disk. Their new technique focuses on the motion of the gas, probing radial pressure gradients in the gas to see the shape of the perturbations—like swirls and eddies in a rocky streambed—allowing astronomers to make a more-precise determination of the masses and locations of any planets embedded in the disk. Their new method successfully confirmed the previously predicted existence of two Jupiter-mass planets around HD 163296. They orbit at distances of 83 and 137 times that between the Sun and the Earth, although their host star is much brighter than our own Sun. "Although dust plays an important role in planet formation and provides us invaluable information, it is the gas that accounts for 99 percent of protoplanetary disks' mass. It is therefore crucial to study kinematics, or motion, of the gas to better understand what is happening in the disks we observe," explained Bae. "This method will provide essential evidence to help interpret the high-resolution dust images coming from ALMA. 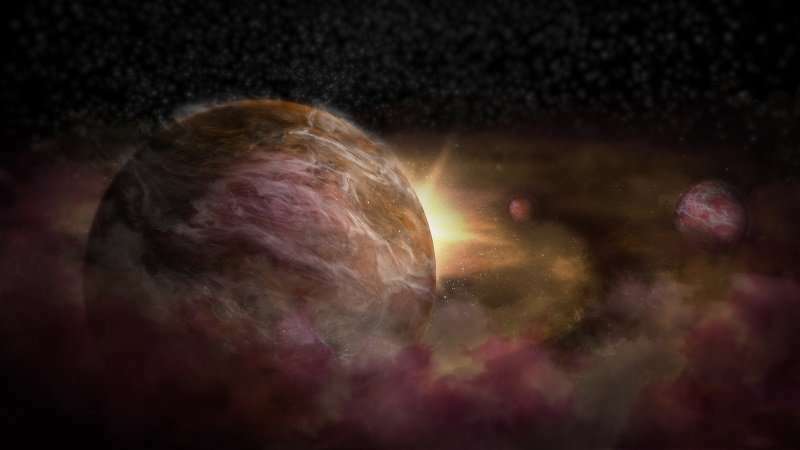 Also, by detecting planets at this young stage we have the best opportunity yet to test how their atmospheres are formed and what molecules are delivered in this process," said lead author Teague.